I recently read Michael Gazzaniga’s book, ‘Who’s in Charge: Free Will and the Science of the Brain‘. Gazzaniga, working with Roger Sperry, performed some of the famous split-brain patient experiments. The results of these experiments had implications for our understandings of consciousness, the self, and free will. In patients with certain types of severe epileptic seizures, who have not responded to other treatments, an operation may be performed to cut the corpus callosum, the neural fibers that connect the two hemispheres of the brain. This operation often improves the seizure symptoms, usually with only minimal effect on the person’s cognitive abilities. They are generally able to function well afterward. Animals tests had previously established that when an animal’s brain hemispheres were separated, they lost the ability to communicate between the hemispheres. However, the apparent functionality of split-brain patients caused uncertainty about whether or not this applied to humans, at least until split brain patient experiments. It was already well known that the left hemisphere of the brain controls the right side of the body, and the right hemisphere controls the left side. Furthermore, the left hemisphere perceives the things in the right field of vision while the right hemisphere perceives things in the left field. Using these facts, scientists were able to isolate communications with each hemisphere in these patients, by controlling what they saw in each field of vision and asking them to do things with each side of their body. 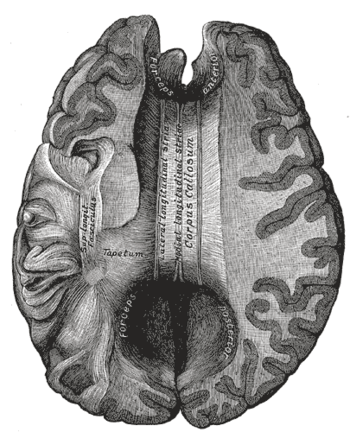 When the right hemisphere was shown an image, the left hemisphere knew nothing about it, and vice versa. When asked to make choices with their hands based on what they had been shown, each hemisphere could only do so with the side of the body they controlled. In other words, it was demonstrated that these patients had two separate consciousnesses. When it appeared as though the hemispheres in a patient could communicate, it turned out to be a situation either where the corpus callosum hadn’t actually been entirely cut, or where one side was able to signal the other, either by body movements or by saying something aloud. In the latter situation, adjusting the experiment made the apparent ability to communicate disappear. Bizarrely, the split brain patients were completely unaware of this situation. Yet they were able to function normally. Language is usually controlled by the left hemisphere, so it was the one that usually answered any questions. In situations where the left hemisphere should have been confused, it confabulated a reason on the spot to explain what the right hemisphere had done. Instead of merely admitting ignorance of why the right hemisphere had done something, it made up a reason for why it did it. For example, a patient was shown images and asked to select associated words from a list. In one case, the right hemisphere was shown a picture of a snow field and understandably selected “shovel” as the associated word. The left hemisphere was shown a picture of a chicken and selected “chicken foot”, again understandably. When the patient was asked why they chose “shovel”, the language controlling left hemisphere, which had seen the chicken but not the snow, instead of saying they didn’t know why they had selected “shovel”, said that the shovel would be needed to clean the chicken coop. The implications of these experiments are important. While there’s no way to know for sure, the ability of the split brain patients to continue functioning normally means that what they are doing is probably not that different from what happens in normal healthy humans, albeit with more internal communication. It means that brain processing is not controlled in any central area. It functions more like a cluster of independent modules that coordinate their actions. So why do we have this strong feeling of unity? Of being one self? The answer of course is consciousness. Consciousness is often called an illusion, but I think a better phrase is that it’s not what it appears to be. Consciousness is not a controlling entity. Gazzaniga refers to it as the interpreter. It was the interpreter that quickly rationalized the other hemisphere’s choice. The interpreter essentially concocted a story after the fact to explain what was done. The strong implication is that this is what it always does. It rationalizes decisions that have already been made. It explains actions that have already been taken. But it doesn’t initiate them. Gazzaniga relates all of this in his book but offers an important caution about reading too much into its implications. Yes, it appears that the conscious self is not in control. But the conscious self is not the whole self. The brain, with all of its modules, including all its unconscious components, makes up the self. Just because we now have insights into the components of the self doesn’t mean that the self isn’t there. And just because the conscious self isn’t in control doesn’t mean that the whole self isn’t. In many ways, this view of consciousness melds well with the Attention Schema Theory of consciousness put forth by Michael Graziano. Graziano believes that consciousness does have at least some control, but I think a better term would be “causal influence”. Consciousness or awareness, aggregates, summarizes, and models some of the information in the brain, and then makes that information available to the whole brain system. In so doing, it provides information that the brain uses in its decision making. Consciousness then is a feedback mechanism, an analyzer. In some ways, it’s like a dictionary, which gives the appearance of defining words, when in reality the lexicographers who compile it simply report how the words are used in society. Or it’s like the news media in a society, which reports back to that society of what’s going on within it. Such an account is always incomplete and often inaccurate, but what does get included in our “public consciousness” influences the decisions that society makes. I’m excited by this growing scientific understanding of consciousness. Is any of it getting at “the hard problem”? I think it depends on how you define that problem. But what is clear is that we know a lot more about it today than we did fifty years ago, and that we’ll probably know a lot more in coming years. This entry was posted in Mind and AI. Bookmark the permalink. When did these split brain patient experiments occur? Is this a procedure we’re still using today? On the procedure, it appears it is still used, although I recall reading somewhere that it’s rarer now with more alternative treatments available. Great post as always. I think your take is pretty much spot on. Excellent review ‘SAP’ – it prompted me to revisit ‘WIC?’ and realize that I had started a skimming reread some time ago, but apparently got sidetracked and never completed it. The interpreter doesn’t know how to say “I don’t know” ! Oh, I almost forgot … The Arbitrator! On the interpreter, you might well be right. I noticed that Gazzaniga tends to have his own vocabulary. He seems to consider the interpreter one aspect of consciousness, considering consciousness overall to emerge from the whole of brain. Ultimately, I think it’s a semantic question similar to Graziano’s insistence that consciousness “controls” some actions. Awesome find on the arbitrator. I think I’ll highlight it. Thanks! Maybe that explains why, while I enjoyed the book, when I finished it I felt like I’d missed something somewhere along the way or should have gotten more out of it than I felt I did. It was strange. You might have been too advanced for it. I suspect you already knew many of its reveals, and I think it’s aimed at someone completely green to neuroscience. I don’t know about too advanced(thanks for the vote of confidence though), but I do have the tendency to read just about everything I can find on book/author in deciding whether or not to buy the book. Maybe that habit bites back, as it were, once in a while I don’t know. Pingback: Do you believe in consciousness? | What is behavioral? It seems to me that if we look at consciousness as a kind of calculator which sees the data presented as a 3D theater, the conscious mind can interpret the stage, props, and actors to determine what is happening or what caused what. It can also add/remove props and actors to achieve a desired end scene. It can also start with an end scene and using what tools it has insert props and actors of varying properties to explain how to get from a previous scene to the current scene. It is not three parts, but one emergent system designed to solve such analog problems among others. All of the problems are related yet provide quite different situations when observed in operation. With the brain split the consciousness has restricted access to all the available props and actors but in the tests was certain of the scenes to be evaluated – so consciousness did what it does best, improvised to explain (solve the problem) the change from one scene to the next. Note also that the not split brain does the same thing when props or actors are missing. Think of times when you know something is happening but cannot see or hear… what does your conscious mind do? It makes stuff up to explain the difference between the known and the new scenes. This is how we got religion. Our brains are good at this stuff.